A lot of people have been asking me about Kickstarter for their projects... so I thought I would get my thoughts down in blog form so I am not repeating myself. I should say this is just my experience, this is by no means how you should run a kickstarter and it's not a guaranteed win. This blog I'm going to talk about things you'll need to think about before you start a Kickstarter campaign, the next one I'll talk about the actual running of the campaign. The Creator Handbook and FAQS will answer most of your questions... and those they don't there are a million blog posts out there which will. 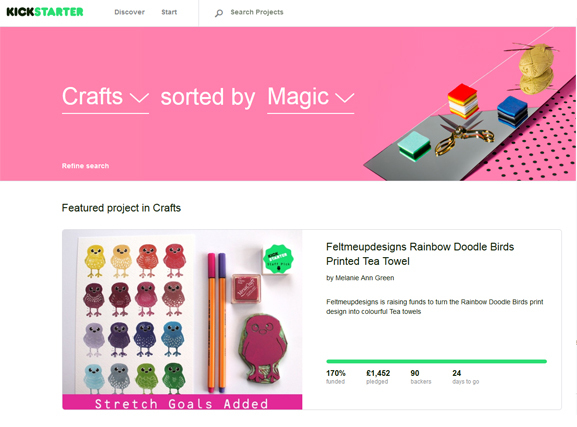 I feel like I had Kickstarter coming out of my ears after all the research I did! Mostly I would say research, research,research because about 50% of Kickstarters fail... what I did was look up the projects similar to mine (there were 8) half succeeded and half failed and I analysed what I thought the successes did right and what the failures did wrong. It's also worth backing a couple of projects if you never have before just to get a feel for how the site works and so you can talk potential backers thru the process if they struggle. I would say do a small project first to test the waters and see if you have an audience out there who will back you but mine got a bit out of control and ceased to be small after the first 48 hours... I was lucky! If I had been smarter I would have done something even smaller to test the process, I made a lot of mistakes which cost me but I came out on top in the end and I learned a lot from the experience which I can apply to my next project. So you've decided it's for you, let's get serious... a lot of people have looked at what I made on kickstarter and said "wow you've made 3 grand!" well yep... I have but this included postage (about £600 of postage if your asking) packaging, producing the tea towels, prints, mugs and stickers. I didn't come out of this with a lot of profit... but I do have a new product line and the stock which will turn in to profit over the coming months...which was the point. Do your costing first, then do them again then get a pal to check them... I screwed up on postage on somethings (kickstarter includes postage in your target which I didn't realise) but it evened out in the end. Include about 15% for kickstarter and credit charge fees and backers who drop out at the last minute (it happens, don't worry too much about it... if you work it into your budget it's not the end of the world). So what's the minimum you need to make to fund the thing you want to do, add 15% then add 20% for tax then add a safety net for any unseen/missed expenses... an oh yeah... profit! You may want to make some of that at some point weather it's future profit in the form of stock or actual profit at the end of your Kickstarter... this is work people! You want to get paid! The best bit of advice I got is that Kickstarter is all about your mailing list/facebook fans/social media contacts/fans/friends/ family... these are the people who will get you to your initial target and help spread the word so don't be bashful about contacting them and asking them to share you project/back you. If you don't have an audience already (look at your facebook, twitter, instagram etc do you have a lot of screaming fans or is it just your mum and your Auntie Ethel) the you need to start building it. Do you have a mailing list for your business? Have you repeat customers you can contact who might be interested. Start a press list of blogs you want to contact, paper press, local news etc... you might want to contact these people before you go live as they are busy people... lots of blogs have a schedule worked out in advance so you may need to contact them early. If you can build a bit of a buzz before you even launch reaching your target will be made easier as you may even have people waiting for your project to go live... wouldn't that be awesome? Next week I'll fit in a blog about writing and planing your campaign. Watch this space! News From Felt Towers... A Studio!!! A Studio!! !